Jump to the full itinerary map. Anguilla's far western end is glamorous. It is home to some of the Caribbean's most famous five-star resorts, lavish and luxurious Anguilla villas, and high-end eateries. Yet hidden amidst all the glitz and glam, are uninhabited coves and beaches, and charming Caribbean sights. A flawless semi-circle of sand, facing due south towards St. Martin, Maunday's Bay is a gem. It is home to Cap Juluca, a resort that has been voted #1 in the Caribbean time and time again by "authorities." There are two ways to get to Maunday's Bay. We always take the secret access road (see map below for directions). This road leads to the far western edge of Maunday's, which is quieter and tucked away from the resort. 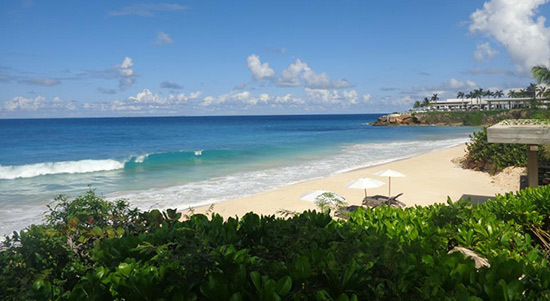 From here, walk the beach, marvel at Cap Juluca's Moorish architecture, cool off in the sea, and maybe even stop in at the resort restaurant "Blue" for a morning cocktail and breakfast. Under a big tent on the beach, many love Blue for breakfast. Special Note: Before you reach Barnes Bay, you will see Foods 95. This is the last grocery store in the west end. Stop here for drinks and snacks. If you plan on doing the "Get Adventurous" part of this itinerary, be sure to load up on water. To reach Barnes, follow the signs to Mango's and park here. In the high-season, Mango's is open for lunch. It's a terrific spot, serving classic lunch fare, perfectly executed. Think roast beef and turkey sandwiches on Sourdough, served with steak fries. Delicious. If you're not up for grabbing a bite yet, grab your snorkeling gear and get on the beach. After a good snorkel, walk the beach just to take a peak at some of the ritziest villas. Starting on the western edge, there is a magnificent green-roofed estate. This was on the market for €30 million! Next door is an exotic beauty, Les Alize, and then Cerulean and Limin' House, each large and luxurious. One winter Robert de Niro, Robin Williams and Billy Crystal stayed in these three. On the eastern end, you have Viceroy's villa suites. Also here is Viceroy's laid-back beach bar, Half Shell. If you're feeling like Mediterrnean food, or just a drink or a refreshing smoothie, stop in! Finally, West End Bay. In contrast to the beaches in the area, this one is quiet, charming and more rustic... local homes, fishing boats bobbing in the sea and likely a few Anguillians cooling off in the ocean. Now, if you're ready for lunch move onto Shoal Bay West & Trattoria Tramonto. If you want to keep exploring, continue to the "Get Adventurous" itinerary! Sherricks Bay is stop #1. With the exception of one villa tucked onto the east end of the bay, the beach is untouched. Only a few pelicans call Sherricks home. 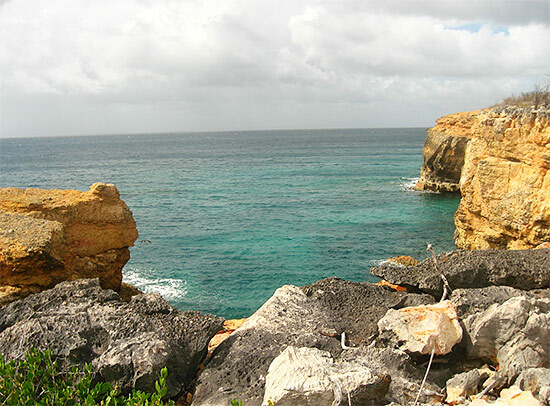 From these rocky shores, you can see St. Martin in the distance and you get a unique view of Covecastles. Rugged and isolated, my Dad fell in love with this beach the minute he stepped out of the car. After Sherricks, this tour gets intense! For those seeking some real exploring, grab your water bottle and a good pair of walking shoes. We are heading to the Anguillita Vantage Point. This is as far west as you can go on Anguilla! To get there from Sherricks Bay, follow "Hike 1 to Anguillita" on the map below. The hike is arduous, with plenty of rocky cliff to climb down and back up again. My Dad almost died on this hike! The return trip did him in. If there are two people or more in your group, it might be best to split up and have the non-hikers grab a rum punch at Trattoria Tramonto on Shoal Bay West. They can meet you with the car at Anguillita an hour or so later. That brings me to the drive to Anguillita. 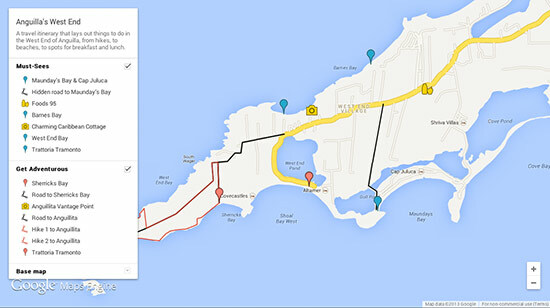 The tip of Anguilla can also be reached by car by following "Road to Anguillita" in the map below. If you take the drive, be sure you have a Jeep. We've scraped our oil pan out there due to the bumpy terrain! Bye-bye car. 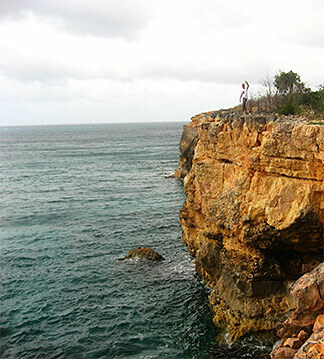 There is one final way to reach Anguillita... via the high cliffs to its north. For this hike, you can leave Sherricks Bay and drive half way to Anguillita and hike the rest of the way (follow "Hike to Anguillita 2" in the map below). It is interesting and truly breathtaking! The hike is on the dangerous side, so do proceed with caution, and don't forget your shoes and water. More on this hike here. Once you get out there, the tip itself is beautiful. Here, the Caribbean Sea meets the Atlantic Ocean often producing strong currents. Isolated, this area feels like the "old Anguilla," with only the odd fishermen or two here casting their lines off of the rocky edges. 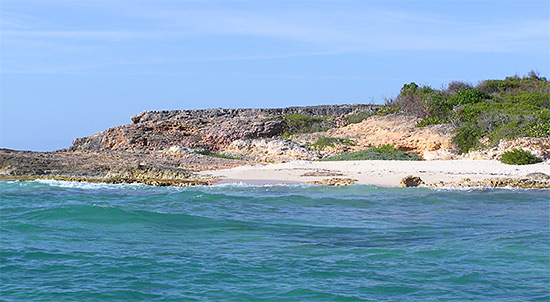 It has incredible vistas out to sea, views of Anguillita Island and a small white sand beach that is always full of bright pink conch shells. Walk down to the sandy beach to the south, explore the cliffs to the north and just take it all in. After all that exploring, finish with a well deserved afternoon of lunching and beaching! Our favorite spot for "beach & lunch" in the far west end is Trattora Tramonto. 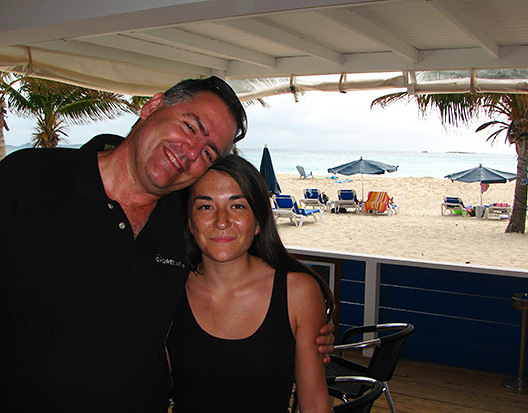 Set on Shoal Bay West, the sand is pristine and the scenery is idyllic, with St. Martin as a backdrop. Laid-back, this Italian beach restaurant serves a tasty panini for lunch. Our favorite is the Wild Boar Panini. On top of the food, the company just can't be beat. Owned by Alan Piazzi, one of the coolest guys I've ever known, we always look forward to our chats. After lunch, take a walk on the beach. The impressive Covecastles run along the bay's western half. Following that is the only private villa on the beach, formerly owned by Chuck Norris and currently owned by a Czech billionaire. The eastern side is home to Altamer. This is where Brad & Jennifer and Courtney Cox & David Arquette stayed when they traveled to Anguilla. The only thing left to do after the walk? A beach snooze on one of Trattoria's chairs!